Buying a home at any point in life is kind of a big deal. For first-time homebuyers, the process can seem especially daunting and monumental — but there’s good news! If you’re considering buying a home for the first time, do your research and save big! According to floridarealtors.org, many people buying homes for the first time have more realistic expectations for what they want in a home, and are willing to save longer to get a better value. By eschewing the traditional route of purchasing a “starter home”, 75% of first-time home buyers are able to save more now in order to buy their dreamhome later. 35% of this group report that their long-term plan is to buy the home they plan on retiring in. First-time buyers — especially millennials — realize the importance of things such as saving up to afford a down payment and sacrificing now for better quality later. At Showcase Properties our team consists of the best market experts who can advise you on your investment and finding the perfect home for your family. How else do first-time homebuyers save when buying a home? Many people considering home ownership for the first time wonder if it’s even worth it — isn’t it cheaper to just keep renting? If you’re a first time home buyer, you’re bound to have no shortage of questions. Luckily for you, we’re here to answer all of those and much more. 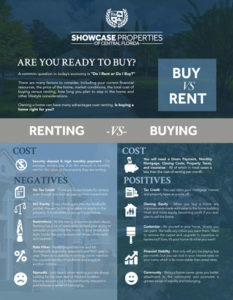 Click the infographic above to see how home ownership stacks up against renting, and whether home ownership is right for you! Are you a first time homebuyer? We can help. Contact Showcase Properties of Central Florida today to speak with an agent that can get your real estate journey off to the right start.